When Should we Quit Praying? Or, How to Pray for Impossible Things. 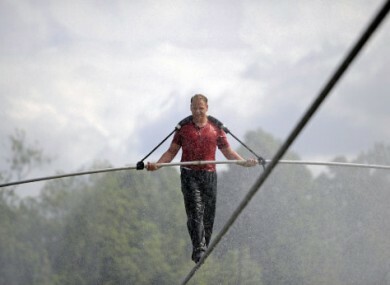 Nik Wallenda performs a walk on a tightrope during a training session in a wind-driven mist at Niagara Falls, New York, on Monday. I’ve know a lovely man who, a few years ago, fell off a ladder, and broke his back, severing his spinal cord. As a result of that tragic minute, he became a paraplegic, wheelchair bound. They have been told the spinal cord damage is irreversible. This has been near impossible for his loving wife, in particular, to accept. Prayer for healing has consumed their lives. Going to healing prayer centres, getting people through the country to pray. They have found it hard to be in home groups, because most members lacked the faith to continue praying for complete healing, which, is, apparently a medical impossibility. But faith that he will be healed has shaped their lives. When they remodelled their kitchen, they put counters at the usual level, not handicapped accessible. She galvanized everyone to pray for healing in time for their daughter’s wedding, so he could walk the bride down the aisle, but, alas, that did not happen. But she remains convinced her husband will be healed. However, I have long been on prayer ministry teams, but do not pray for things I lack faith to believe will happen. When a much childless older woman asks me to pray for a baby, I think biology and fertility and inexorable facts, and try to get someone with more faith to pray for her. To my shame, I lack faith to pray for healing when people in wheelchairs ask me to pray that they will walk again, or near-blind people ask me to pray that they will see. Technically, I believe in miracles; practically, if I can’t “see” it happen, I don’t want to toy with their faith, and damage it further. To pray for something I do not have the faith to believe will happen feels almost like mocking God, and so I get help. Heidi Baker says the blind have seen and the lame have walked when she has prayed for them, and I believe her. These miracles have been attested by eyewitnesses from many nations. But that is her “anointing,” what she has faith to believe will happen, and so what she sees happen, again and again. My faith, far weaker than hers, is strong in different realms. There is a saying in Charismatic circles: You must see it to receive it. I frowned the first time I heard that; it sounded as if it came from a productivity book. But I now think it’s true. Secular people would call it “creative visualization.” Perhaps, you must somehow “see” it happening in the spiritual realm to be able to believe it will happen –and then to later see it actually happen in the physical realm. And so I never pray with people for things I cannot “see” happen or believe will happen. Faith, however, does move mountains. My husband’s small group has been consistently praying for Tamsyn, the Manic Mum, who is a friend of the leader. As you can read, her husband Alex suffered a minor brain injury playing rugby in France with friends, which through a series of unfortunate medical mistakes, led to brain swelling, epilepsy, blindness, drastically impaired speech and movement. The French doctors delicately said he would be “a vegetable.” The English doctors delicately suggested she put him in a long-term nursing home, and get on with life. As Dr. Dean Ornish comments, the speed and even the possibility of recovery from brain injury depends on love, depends on how much time people are willing to invest in helping you rehabilitate. Tamsyn, a Christian, refused to accept the predictions and has been helping Alex try to speak, move, respond, cross one minuscule milestone after another, as you can read on her blog. And the power of faith and prayer should never be under-estimated. A mum in a small group I went to was diagnosed with glioblastoma multiforme, the most deadly kind of brain tumour, and given two years max to live. Most people die within six months of diagnosis. She got intensive prayer from our whole church, and is alive, functioning and even travelling, four and a half years later, despite some physical and mental deterioration. I put this down to the power of prayer. So how do we pray for impossible things? Ah, how hard, how inexpressibly hard it is to believe in the good story God is writing in your life when it involves pits and dungeons, as with Joseph; dens and lions as with Daniel. The valleys and depths in which one is prepared for the mountain-tops of glory and spiritual promotion!! But, hey, ultimately, we are only co-authors of the story of our lives. We need the humility and flexibility to accept it when God appears to be writing a different plot, a different story, than the one we had dreamed of, and hoped for. Accept the plot change, even while we continue to pray for the plot we want. Oh, this tight-rope walk of faith!! We only get through it without broken hearts because He, whom we love and trust, is our balancing wire as we cross the Niagara Falls of our lives with faith and hope. And a smile! What I find hard is the tension — how to ask for real — with expectation? — AND have real acceptance in case it's no — seems like a cake and eating it conundrum. I wonder in Gethsemane if Jesus got an answer — or if, after his third iteration of the prayer, he just stood up and moved forward, perhaps uncertain what would happen? Thank, LA. Yes, I have been thinking that balance is as important in the spiritual life as in real life. That we cannot focus our spiritual lives on one thing, healing, let's say, or creativity flowing like a river, which is what I desperately wanted at a stage of exhaustion and burnout in my own life. So I guess the Gethsemane prayer is the way to pray with peace. Loving Father, please may I have this. BUT not as I will, but as you will. This post is near and dear to my heart as I see so many people damaged (indeed, I use that word judiciously) severely by this notion of “if I don't get what I'm praying for, I must not be worthy”. I have seen people leave the church, suffer deep depression and even become suicidal after being pushed by so-called “faith-healers” into thinking that they're not being healed because they don't have enough faith. Instead of wasting the countless hours, the couple with the paraplegic, could have been hearing God's call to advance His Kingdom through other means. I find their search for healing to be selfish and prideful. Prideful because in insisting upon the healing (rather than the two-pronged prayer as you suggest), they have created a situation where they are TELLING God what his will is, rather than accepting the path he has chosen for them. Why do people always want to play God? It is funny that as I read the opening of your blog, the whole time, I was thinking of the prayer in the Garden as well. The two-pronged approach of “this is my will, but I will accept your will without question”. I had a friend whose life goal was profound to me and this post reminded me of it. Her approach to life was that in everything, there is an opportunity for us to learn something about God. We must, at every time and place, be looking for that opportunity and learn that lesson. The two-pronged prayer approach, to me, is the surest way to live out that goal. To see in everything an opportunity to be Christ-like in our acceptance of God's will and to learn what we are meant to learn. You pray in trust, accepting either outcome in trust. Intriguing! And yes, hard to discern hard-headedness from faith sometimes! And equally hard to discern giving up from acceptance!